The only disc storage solution you are proud to display! Organize your prized collection of DVDs, CD's, Blu-Rays, Video Games, and other discs safely and neatly with Bellagio-Italia's best-selling Classic DVD Binder. Thoughtfully designed structure and high-grade materials provide security and protection, while remaining durable for several years. Patented Acid-Free sheets keep your discs safe for 10+ years, while allowing you to store and display cover art for each disc. Customizable index plate on spine allows you to label each Binder with unique collection names. 3 Ring Binding works with Bellagio-Italia replacement sheets (item # 11349). Each Binder arrives with 12 sheets, enough capacity for 48 discs, and can be expanded to a total of 20 sheets, to house 80 discs. Classy design and colors make these binders look and feel like an old book. Handstands stands behind all of their products with a 100% money back guarantee! CUSTOMIZABLE INDEX PLATE- label each binder with the customizable index plate on the spine by either removing the card and writing on it, or downloading template from Bellagio-Italia Trading. 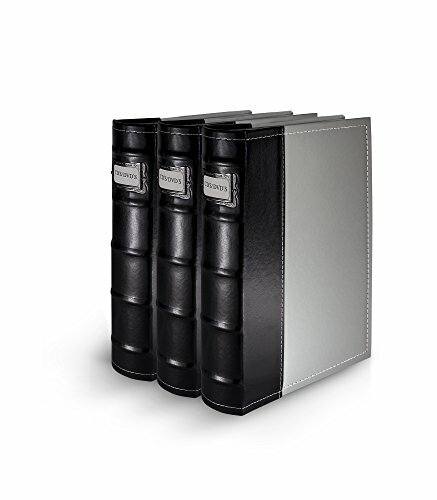 Co.
QUALITY DESIGN- premium materials and quality craftsmanship ensure each binder looks and feels as classy and elegant as a classic book. If you have any questions about this product by Bellagio-Italia, contact us by completing and submitting the form below. If you are looking for a specif part number, please include it with your message.